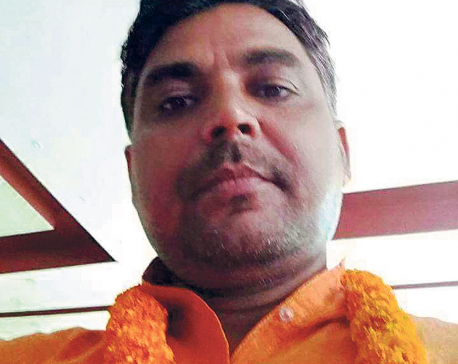 KATHMANDU, July 24: Rastriya Janata Party Nepal (RJPN) has proposed an absconding murder-accused as a state minister in the Province 2 government. RJPN parliamentary party leader Mahantha Thakur on Monday recommended Abiram Sharma as state minister for social development, along with two others state ministers, in the provincial government. Sharma was the ringleader in the lynching of injured Armed Police Force(APF) Sub-Inspector Thaman BK in Jaleshwor when he was being rushed by ambulance to Janakpur Hospital . BK was beaten up indiscriminately and seriously injured by Madhesi protestors. The Supreme Court has already ordered police to arrest Sharma on the charge of killing BK in the course of the Madhes protests . Police have issued an arrest warrant as per the court order. PP leader Thakur has picked Suresh Mandal as state minister for industry and tourism and Dimple Jha, who is the spouse of erstwhile Sadbhawana Party leader Anil Jha, as state minister for physical infrastructure in the Province 2 government. Party insiders said the nomination of Sharma for state minister has fueled dissatisfaction within the RJPN. Senior RJPN leaders expressed concern that the recommendation of such a controversial character as minister would damage the image of the party. They also said the nominations were not inclusive as there was no Dalit or Muslim. With the addition of three state ministers, the Province 2 government will have a total 13 ministers, including seven ministers and six state ministers, from both the Federal Socialist Forum Nepal and RJPN together.